Carl's Place is the internet's leading DIY resource for quality projector screen material at a great low price! Blackout Cloth is our top-selling Projector Screen Material making it a budget-friendly, do-it-yourself screen building favorite! This front projection blackout fabric surface is the standard to which all other screen surfaces are compared. Blackout Cloth's matte white surface and gain of 1.0 diffuse light in all directions so the image can be seen from any angle. Blackout Cloth material is 70% polyester, 30% cotton blend fabric that is coated with multiple layers of thin rubber and is 110" wide. It is suitable for use in a variety of settings with accurate color and clarity in a dark viewing environment where ambient light is controlled. Blackout Cloth screen material is extremely sturdy and is best for a wooden fixed frame where it will be stretched tightly and evenly in all four directions (tight like a drum). It also works for our tension-mounted Finished Edge Screens, Hanging & Standing Kits. You should project onto the smooth, rubber side of Blackout Cloth projector screen material. Why buy Blackout Cloth? Buy Blackout Cloth for a perfect entry-level, budget-friendly DIY projector screen! Tip: Don't forget to Buy Carl's Black Felt Tape for a professional-looking, contrast-boosting border (sold separately). Search ASIN B00JF7IXXU to Buy Carl's Black Felt Tape now! * In the DIY market there is a wide range of comfort levels, skill sets and abilities. If you are at all concerned about folds and wrinkles you may want to consider ordering your material rolled, if available. Tension-mounting/stretching the material tight like a drum, will pull out folds and wrinkles although it may take extra time and effort to install. View our Technical Specification documents below for additional information including; shipping specifications, installation guide and a comparison to Carl's other projector screen materials. 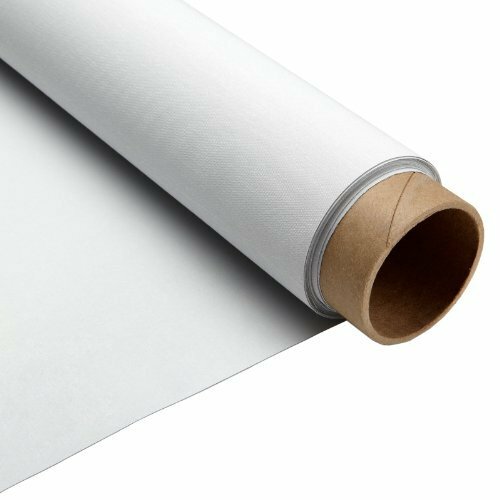 Blackout Cloth is our top-selling Projector Screen Material making it a budget-friendly, do-it-yourself screen building favorite! This front projection blackout fabric surface is the standard to which all other screen surfaces are compared. Blackout Cloth's matte white surface and gain of 1.0 diffuse light in all directions so the image can be seen from any angle. It is suitable for use in a variety of settings with accurate color and clarity in a dark viewing environment where ambient light is controlled (dark viewing environment). Blackout Cloth screen material is extremely sturdy and is best for a wooden fixed frame where it will be stretched tightly and evenly in all four directions (tight like a drum). Ships Folded in a Box*, however select sizes have the option to ship rolled on a tube. Due to its popularity, several sizes are available to ship from Carl's Place (CP) or from Amazon's warehouse (FBA). View More In Projection Screens. If you have any questions about this product by Carls Place, contact us by completing and submitting the form below. If you are looking for a specif part number, please include it with your message.